When I relocated in 2009 I had no source of income. I had not been allowed to work and so having a job was a very intimidating idea. I worked at a paper route, a cleaning job and also cooked for a girl’s co-op on campus. I planned the menu and had to follow a budget for around 25 girls. Of course some girls had dietary restrictions and that was also addressed in the menu. I shopped for the groceries and made the dinner meal. It was quite a challenge, but still I brought my home cooking to this house of girls. Making homemade chicken pot pie and rolls, curry and rice became the standard in my kitchen. The facility was old and not the best cooking space but I had plenty of experience making do in my years with a two burner stove that shocked me and my months with little electricity. So, while I struggled a bit, it honestly was allot of fun. On grocery days I made tacos, salad bar and sandwiches. 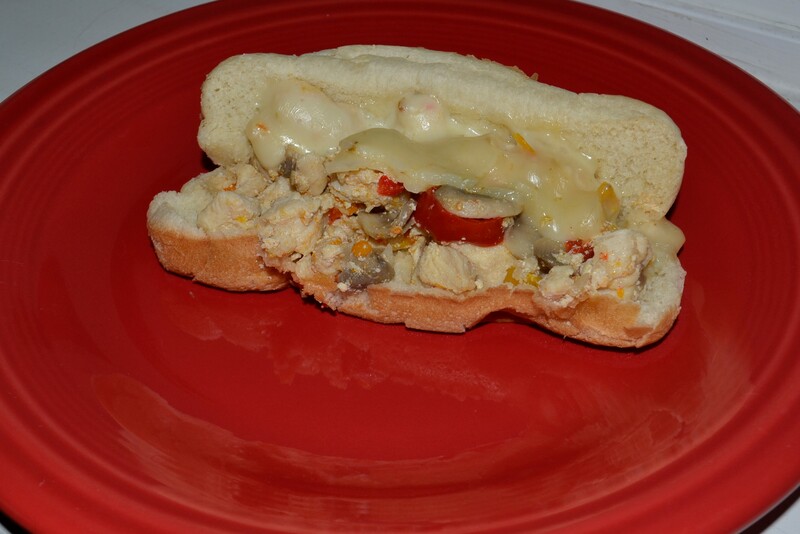 This chicken and pepper sub was quick and easy and a favorite. For the girls who were vegetarians I made a pan without the chicken. Sorry the picture is not great but some things just don’t photograph well! Saute chicken and onions in olive oil, cover until done, add salt and pepper. Add peppers and fry until peppers are desired tenderness. Add mushrooms and continue cooking. Place sub buns on a baking sheet and put in preheated oven to lightly toast. Remove from oven, place chicken and pepper mixture on each bun and top with cheese. Turn oven to broil and put sandwiches back in to melt cheese. When cheese is melted remove from oven. I like to get a little of the broth from the pan onto the bun as well! This makes it extra yummy.